Politician and premier, Richard John Seddon (1845–1906) and his family were long-term members of the Old St Paul’s congregation, and Richard’s family had a memorial erected to him in the church after his death in 1906. When Seddon’s wife Louisa died in 1931, her children arranged for the design and manufacture of a processional cross to be presented to the church in her name. From its origins in London to its current home at the Cathedral, this object has had a past linked to some very interesting people. Louisa and Richard (pictured above, c1897) had 11 children, nine of whom survived. When Louisa died in 1931, it was her daughter Dame Elizabeth (known as May) who arranged for the processional cross to be made. May was an incredible woman. Involved in an array of organisations and committees, she was known for speaking her mind, being a skilled and persuasive orator and having an unwavering energy in matters of welfare that rivalled her father’s. May continued the family connection to Old St Paul’s all her life, and her funeral was held there in 1960. 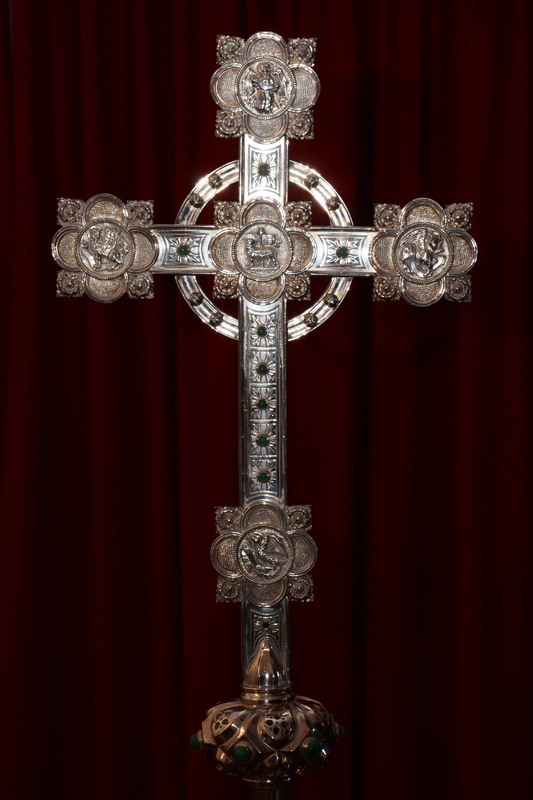 A processional cross in polished brass, lacquered. Length 25 in, width 13 ¼ in. Engraved and jewelled cross. Four chased emblems in silver of four evangelists. Centre of cross Agnus Dei. Nine embossed jewel New Zealand greenstone. Pierced and jewelled knob also surmounted with NZ greenstone. Oak stem with brass ferrule. Inscription: To the Glory of God In Loving Memory Louisa Jane Seddon 1851 – 1931 Given by her family to St Paul’s Wellington. The cross was made in London and shipped to New Zealand in 1932 with an invoice for £82. However, it is perhaps possible that May didn’t get her wish for New Zealand greenstone (pounamu) – the greenstone inserted in the cross looks rather too light to be real New Zealand greenstone. Update: Louisa’s great grand-daughter had written to the website to say that she has been told the green gems are called Chrysoprase, and probably from central Russia. Every Sunday at Old St Paul’s, the cross was used at the start of services; a crucifer would carry it into the church, leading the choir. The crucifer was a very prestigious position held by one of the laymen of the church. When Old St Paul’s closed for regular services in 1964, the Seddon Processional Cross was one of the objects taken by the Anglican church to the Wellington Cathedral of St Paul and today continues to be used there every Sunday. It has been ‘silvered’ to match the altar cross and candlesticks. The cross is still also used for the processions to mark the 25th and 50th anniversaries of the opening of the Cathedral (as seen in the main image of this story, where it is being used to lead a procession from Old St Paul’s to the Cathedral, for the Cathedral’s 50th anniversary in 2014). It is an interesting example of a precious object still kept alive and useful, in use for its original purpose. For information about the wedding of another of Richard and Lousia’s daughters, which took place at Old St Paul’s, see this post.